Did We Learn Our Lesson on Pipeline Safety? <strong>YECH: </strong> Refugio Beach and surrounding areas were a sticky mess right after the spill and in the days following. One sunny Tuesday this May, Santa Barbara County Fire Captain Craig Vanderzwaag found himself tracking down the source of an overwhelming stench reported near Highway 101 and Refugio. He and two firefighters would trace the fumes to the nearby beach, where they were shocked to find black waves crashing on the shore. 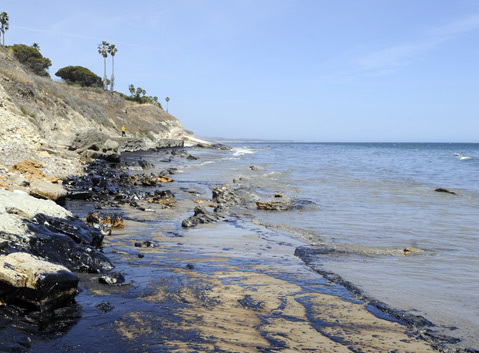 The May 19 event would become known to Santa Barbara and the nation as the Refugio Oil Spill. The rupture of the now-infamous Line 901 leaked an estimated 140,000 gallons of crude, with 21,000 gallons washing into the Pacific Ocean. State wildlife workers would eventually collect 202 dead birds, 65 live ones, 99 dead mammals ​— ​including 15 dolphins ​— ​and 63 live mammals. Among the animals collected, 69 pelicans, sea lions, loons, and others would later be freed. As the U.S. relies more on domestic crude oil, it’s no coincidence there have been more spills. Plains All American Pipeline, the oil transportation company responsible for the spill at Refugio, has been ranked fifth in “spill incidents” by the U.S. Department of Transportation with its 175 spills in the past decade. Of those, half were 215 gallons or less. The executives of the multibillion-dollar company, operating 16,000 miles of pipelines in America, could face misdemeanor charges for negligence in Refugio. Separate class-action and civil lawsuits have been filed. On the day of the spill, 18 emergency responders, managers, and oil-industry workers happened to be gathered at the county fire station at Gaviota for an annual oil-spill drill. Responding to calls, the entire group, including Plains workers, rushed to Refugio State Beach, where confused firefighters scrambled to find the source. Crossing the freeway, the group found a wet pool of crude, roughly 20 by 50 feet, spilling into a concrete culvert that ran under Highway 101. Two Plains workers were already there, making cell phone calls. Though a Plains operator in Midland, Texas, had shut down the pipeline at 11:30 a.m., a company representative in Bakersfield did not report the location coordinates and estimate spill volume to the National Response Center (NRC) until 2:56 p.m., according to federal records. County fire personnel made reports of unknown oil on the beach and in the water multiple times beginning at 12:43 p.m. At 2:07 p.m., fire officials reported the oil was coming from a Plains pipeline. The extent that the Refugio Oil Spill will make a difference in the prevention and response to manmade disasters will become clearer in 2016. But synopses thus far indicate Santa Barbara beaches were not contaminated in vain. It appears the obscure agency known as PHMSA, which stands for Pipeline and Hazardous Materials Safety Administration, is poised to enact tougher restrictions on pipeline operators such as Plains. California has already adopted three new laws addressing prevention and inspection of pipelines as a direct result of the Plains spill. One was introduced by Assemblymember Das Williams; two were introduced by State Senator Hannah-Beth Jackson. No oil spill fits the mold of one contingency plan. The dynamic between locals highly protective of the Gaviota Coast ​— ​rich in ecological diversity ​— ​and the federal agents hailing from out of the area demonstrated that even the best plans are only as efficient as the human beings employing them. But the plans and regulations in place lacked teeth. Line 901 was the only oil pipeline in Santa Barbara County not regulated by the county’s Energy Division, and, not coincidentally, the only pipeline not equipped with an automatic shutoff valve. The pipeline was overseen by the small, notoriously understaffed federal Pipeline and Hazardous Materials Safety Administration. Line 901’s interstate designation (meaning it crosses state boundaries) dates back to its original construction. It was intended to connect to energy infrastructure traveling to refineries in Texas, but it’s unclear if the pipeline ever transferred oil out of state. Today, the pipeline terminates in Kern County. PHMSA, whose workers are known to jump ship for higher-paying, private-sector jobs, was pushed by Congress earlier this year to hire an additional 122 new positions, including 109 dedicated to the Pipeline Safety program. Of those, most are inspectors in the field. To date, 67 percent of the inspector positions have been filled, according to PHMSA spokesperson Artealia Gilliard. What’s more, PHMSA is drastically behind in updating its rules. In 2014, the agency failed to meet its deadline to do so after it was instructed to start the process in 2010 following a number of incidents across the nation. After the Refugio Oil Spill, Congressmember Lois Capps introduced a measure to set aside funds to finalize the pipeline rules. In October, the pipeline agency released several proposed changes, such as requiring leak-detection systems for all new hazardous liquid lines and requiring more frequent pipeline inline inspections in areas not designated as environmentally sensitive. Earlier this month, the Santa Barbara county supervisors said the proposal fell short. Among many changes, they suggested the rules should broaden the definition of areas deemed ecologically sensitive. In addition, the supervisors insisted automatic shutoff systems be required for liquid pipelines, noting that the Plains pipeline is the only one in the county without such safety technology and that having shutoffs could have minimized the spill’s “substantial environmental damage.” They suggested the system should automatically shut down the source of oil upon 15 percent deviation from normal operating parameters and should include an alarm that notifies the operator at 10 percent deviation to prevent a potential leak. In fact, high-ranking PHMSA officials personally came out to meet with county officials on at least three occasions. There were dozens of conference calls between the two agencies, according to county planner Matt Young. “They were very responsive where they could be,” he said, noting limitations presented by the ongoing investigation. Earlier this month, Plains’s Line 903 ​— ​which connected to the ruptured pipeline ​— ​was successfully purged of crude that had been sitting idle since PHMSA ordered it shut down nine days after the spill. Environmental Defense Center Chief Counsel Linda Krop noted that changes already adopted at the state level could be used as a crowbar to influence national regulators. Specifically, changes compel the State Fire Marshal to inspect pipelines annually, require the state’s Office of Spill Prevention and Response (OSPR) to expedite processes, and oblige pipelines in ecologically sensitive areas to be equipped with the best leak-detection technologies, including automatic shutoff valves.